Workout motivation from your own personal trainer, whenever and wherever you need it! Get motivated to work out with daily messages from your own personal trainer, Robin B. Palmer. 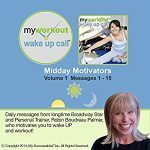 Each message includes a warm-up stretch, a fitness tip of the day, and music to get dressed to work out by, and it ends with a standing ovation–because you deserve it! Volume 1: Stretch, hydration; wake-up workout exercise for success; my fitness story; self-care first; health coach messages; stretch–new routine; your love list; visualization–change to win; overcoming inner roadblocks; stretch–stress relief; cross-train your brain; inflammation prevention; positive energy. Volume 2: Warm-up stretch; Personal trainer; Work out partners; Making healthy habits; Back on track; Fun new workouts; Workout motivation; Stretches; Affirmations; Workout motivation; The Secret; Fitness health benefits; Fitness motivators; Workouts at any age; Community support encouragement. Personal trainer and former longtime Broadway star Robin Boudreau Palmer invented My Wake UP Call® Motivational Alarm Clock® messages & My Good Night Messages’™ patented, five-minute messages with renowned experts, which bookend every day with inspiration to live your dreams when it matters most. Featured in/on Shape, Self, USA Today, Fox, and NBC-TV and in Robin’s TEDx Talk, “The Most Important Minutes of Your Day”. Messages can also be played as Motivational Alarm Clock® messages and My Good Night Calls™ bedtime reminders with most free alarm apps at the Apple Store or Google Play or with a list of recommended devices. 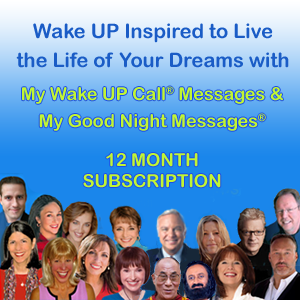 My Wake UP Call®, My Wake UP Calls®, and Motivational Alarm Clock® are three of eight registered trademarks of My Successables™ Inc. ©2014 My Successables™ Inc. All messages and message formats are copy written. All rights reserved.